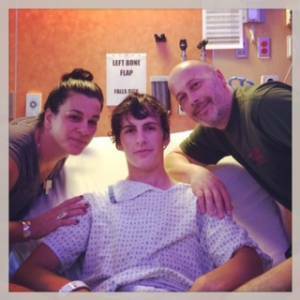 On July 7, 2014, our then 14-year-old son, Willi, fell off his longboard in the neighborhood. (A longboard is a type of skateboard that’s longer and faster than most boards.) What followed was the kind of night that parents fear. Willi had not been wearing a helmet. Despite no external injuries, he had cracked his skull, and his brain was bleeding in three places. Debbie Song, M.D., a pediatric neurosurgeon at Gillette, performed an emergency craniotomy that night, and Willi was admitted to the Level I Pediatric Trauma Center operated by Regions Hospital and Gillette Children's Specialty Healthcare. Those first few days were full of uncertainty and fear. 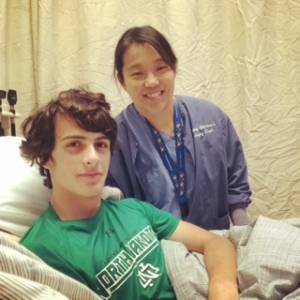 Watching the doctors and nurses care for him in such an acute situation was amazing to us. They were consistently calm, respectful and efficient. And it wasn’t just Willi they were taking care of either. They made sure Willi’s father and I were eating and drinking, and they encouraged us to sleep. They were helping us manage our mental and physical health so that we could be as strong as possible for Willi. The nurses and doctors spent so much time answering our questions and comforting us. Never did we feel like anyone was rushing us, or bothered by our constant need for reassurance and comfort. As we were working to wrap our minds around what had happened many staff members from Gillette’s well-oiled team came by to let us know what they had set up for us. Child Life helped us organize a time for Willi’s friends to come up to the hospital so they could be together and make cards for him. They also helped us navigate this new terrain with Willi’s little sisters. They gave us bears and coloring books to give the girls when they came to see him, as well as fantastic advice about how to get them ready for their first visit. We were given a room at Ronald McDonald house that we used to rotate family through for naps and showers. We had hot, delicious meals provided by amazing volunteers. We met a social worker who helped us navigate all of the new information. She was always there for us when the new questions popped up, and she guided us through our stay in the PICU and our transition over to the rehab unit. We never asked for these services. In truth, we didn’t know they existed. Gillette anticipated our needs at every turn. After a while, our friends and families had to go back to their children, their towns and their jobs. It was scary to think of being there “alone,” but we never were. I’m not sure when it happened, but it seemed all along that everyone at Gillette knew us and was part of the team taking care of our whole family. From the staff who always came in so respectfully to clean Willi’s room, to the desk managers at Ronald McDonald, everyone always asked how we were doing. Sometimes they got more than they bargained for, and even then, they would spend time reassuring us. For weeks, people hugged us and shared our joys and fears. How do you say thank you to the doctors who saved your child’s life? How could we ever explain how much it meant that people said hello, hugged us without reservation when we needed it, and laughed with us in those impossibly amazing moments? Their openness to us made us feel safe in a time when nothing felt OK.
Daily we see people raising money for various charities that help people in crisis. I have thrown my change in the bucket in the drive-thru window for years to give to Gillette fundraisers, but not once did I ever consider I may someday be using those services. We are so grateful for all of the supports that Gillette has in place for the life’s unpredictable moments. Today, Willi is heading into his junior year at Hill-Murray. When he isn't working his summer job, he enjoys hanging out with his friends and just being a teenager. We call his recovery a miracle. We know it was a miracle carried out by many hands.